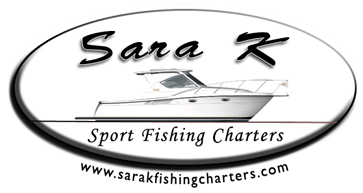 Sara K Sport Fishing Charters | We Guarantee Fish! 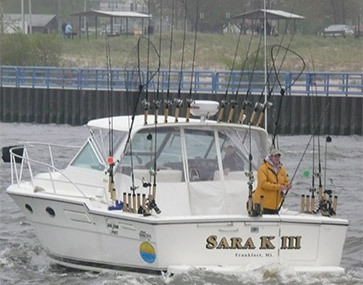 Come for a day of spectacular Great Lakes Sport Fishing aboard the Sara K III and leave with memories for a lifetime! Situated in beautiful Frankfort, Michigan (35 minutes from Traverse City) you will enjoy some of the greatest salmon and trout fisheries in the world. Let us take the work out of fishing while you enjoy reeling in some trophy catches. Frankfort, a designated Tree City USA, is located on the beautiful shores of Lake Michigan less than an hour southwest of Traverse City. The quaint city of approximately 1,500 residents is an ideal vacation destination. Check out the boat & crew! The Sara K III is a 33' Tiara Open, and is equipped with everything needed for a safe & fun trip. Captain Greg is a licensed U.S.C.G. Master Captain and has been fishing out of Frankfort, Michigan for years. 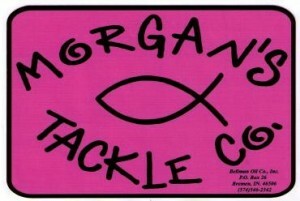 King Salmon, Coho Salmon, Lake Trout, Brown Trout, Steelhead & more! The Lake Michigan fishing season lasts from May to September/October.